A downstream process that leverages the advantages of innovative technologies such as disposables, in-line monitoring, and high-throughput systems as well as the robust methods for its harvest and purification steps can significantly improve in a company’s time (and cost) to clinic or commercialization. The 2011 BioProcess International Conference and Exhibition provides forward-thinking presentations that can help you define, characterize, and simplify your downstream design space. Many biomanufacturers have already experienced the advantages of high-throughput systems and platform processes in their efforts to accelerate process development and reduce time to clinical trials. The preponderance of biologics on the market today are monoclonoal antibodies (MAbs), which have a well-established, well-characterized manufacturing process. Although many MAbs can undergo platform processes, others cannot and so require further development. At the BPI conference, Deepa Nadarajah (bioprocess engineer of purification development at Genentech, Inc.) will discuss a case study involving the process development of a MAb that binds to anion-exchange resin under platform flow-through conditions (“Challenges Associated with Development of a Polishing Step for a Nonplatform Monoclonal Antibody,” Thursday, 10:30 AM). TAKE-AWAY: STREAMLINE DOWNSTREAM PROCESSING TO IMPROVE COST AND TIME TO CLINIC, OVERCOME BOTTLENECKS, AND ENSURE PRODUCT QUALITY. A good “process fit” between plant and process is an important part of establishing and maintaining robust, high-value operations. Currently, biomanufacturers are implementing advanced automation and software to monitor and control their processes. In his presentation, Jeffrey C. Baker (consulting LSS black belt, formerly with Eli Lilly and Company and MedImmune) will discuss how manufacturers can use those systems to anticipate facility performance while increasing value from high fixed-cost assets. Technology includes model systems, process trends analysis, and quality by design (QbD) programs that contain plant capacity and throughput constraints (“Fitting the Glass Slipper: Process Design, Plant Capacity, and Value Realization,” Thursday, 11:30 AM). Within the past five years, the bioprocessing industry has moved from understanding the benefits of implemting QbD and process analytical technology (PAT) to taking the initial steps toward using such concepts in real-world applications. 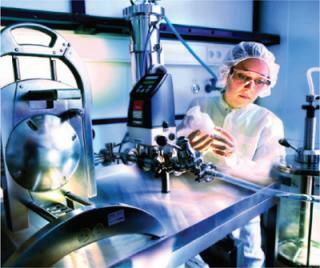 The complexity of biopharmaceuticals makes their manufacture a challenge. As presenter Ji Zheng (senior scientist of biologics development at Allergan, Inc.) observes, proper application of QbD during process development yields a “process map” from raw material to finished product, and PAT can potentially act as a guide (like a GPS) for reaching your “destination” (final drug substance manufacturing process). Zheng will discuss how QbD and PAT were used to streamline downstream process development of a protein produced in Escherichia coli. Allergan’s implementation took place in downstream process development during tangential flow filtration and chromatography steps for removing impurities and maximizing recovery of the active protein for an early stage manufacturing process (“Application of QbD and PAT Methods to an E. coli Protein Purification Process Development Project,” Friday, 11:15 AM). Although the molecular weight and physical properties of bioconjugate molecules can differ greatly, their development and optimization can include typical challenges that must be addressed. One common challenge is aggregation, which can occur through both covalent (chemical crosslinking) and noncovalent interactions. Brandi Osborne (senior scientist of conjugation and polytides process development at Pfizer Inc.) will present unpublished data in her study providing examples of challenges encountered during development for both antibody conjugates and therapeutic vaccines (“Bioconjugate Processing Challenges: Aggregation Case Studies,” Friday, 2:30 PM). Using disposables in manufacturing provides several well-known processing advantages. Facilities that implement single-use technologies heavily have had to address challenges related to potential extractables and leachables from those components. Ravi Samavedam (associate director of validation at Shire Human Genetic Therapies) will present unplublished data from a case study involving an approach to assess potential risk from individual disposable-component use as well as the cumulative risk to process or product due to the use of multiple disposables. Samavedam will also report on how quality risk assessments together with in-process or simulated testing for process clearance of potential leachables can be a means of evaluating process and product risk (“Technology Transfer into a Fully Disposable Facility: Assessing Risk from Extractables and Leachables,” Friday, 4:00 PM). The important process characterization phase of a process development plan can be time-consuming. Characterization is conducted with the aim of achieving process understanding while adhering to prescribed timelines. Predefined tools and rational experimental design can facilitate this understanding. Rick St. John (senior engineer of purification development at the biologics department of Genentech, Inc.) will report unpublished data related to tools his company developed for its risk-based experimental design of characterization studies (“Risk-Based Experimental Design for Purification Process Characterization,” Friday, 4:30 PM). Downstream purification processes for large-scale biologics manufacture usually require large quantities of buffer, which can make preparation, storage, and logistics challenging. Matt Kessler (research associate engineer at Merck Sharp and Dhome) will discuss his company’s automated in-line formulation buffer system. It can respond to changes in program schedules and distribute ready-to-use buffers to process suites (“Design and Installation of In-Line Formulation Buffer Systems for Large-Scale Biologics Manufacture Processes,” Friday, 8:45 AM). Legacy cell culture manufacturing plants face increasing challenges in handling modern cell culture processes with titers >2.5 g/L. Rajesh G. Beri (director of manufacturing sciences and technology at Lonza Biologics) will present a case study of some problems his company faced particulary in downstream purification, including the range of potential solutions that can be implemented. Beri’s presentation will also include recent case studies of high-titer processes executed at a legacy Lonza facility (“Overcoming Downstream Purification Challenges in Executing Modern High-Titer Processes in Legacy Manufacturing Plants,” Friday, 9:15 AM). Biomanufacturers implement several approaches to handle complex refolding steps, especially when scalability issues must be considered. Future technologies include analytical on-line monitoring. Gerlind Stoller, (head of downstream process development at Sandoz Biopharmaceuticals Technical Development, Sandoz GmbH) will evaluate the experiences and results of large-scale refolding reactions and their development. Stoller will also address challenges of scaling up and down in the context of current requirements of process understanding and validation (“Into the Folding Future,” Friday, 1:30 PM). To clarify high–cell-density mammalian cell culture broths, operators typically combine centrifugation and depth filtration, before a 0.2-µm filtration step. Linda Rich (research scientist of technical operations at Abbott Laboratories) presents unpublished data on a study in which acidification of a cell culture broth was evaluated as a means of improving filterability and clarification performance. She will describe the effects of the acidification of cell culture harvest before cell removal. Results from her team’s study showed that cell culture acidification not only reduces host-cell impurities, but also helps to improve filtration throughput of depth and sterile filters, which can increase process robustness and reduce filter costs. The study also showed that acidification markedly improves product clarity during the holding period between harvest clarification and capture, which also saves filter cost (“Acidification as a Means for Reducing Impurity Levels and Improving Throughput in Harvest Operations,” Thursday, 2:15 PM). Sheldon Oppenheim (senior engineer I at Cambridge Biologics CMC Group, Millennium: The Takeda Oncology Company) will report unpublished data from a study that invovled the use of micro-CCD technology and software to obtain a detailed analysis of particle removal during a harvest process. Operators performed disk-stack centrifugation and depth filtration to analyze various time points during the process. Researchers were able to identify the size and number of particles that could potentially challenge downstream operations (“Understanding the Harvest Operation using Dynamic Particle Sizing Technology,” Thursday, 2:45 PM). MAb purification can be complex, and biomanufacturers are seeking methods of streamlining each step. Faster, less-expensive purfication translates into overall significant process cost savings. Guihang Zhang (scientist III and group leader of process development at Agensys, Inc.) will discuss a case study in which a simple and semicontinuous MAb purification process was developed using only one buffer species and four buffers. The process includes a protein A affinity column step; a continuous-flow cation-exchange (CEX) column with anion exchange (AEX) filtration and viral filtration step; and an ultrafiltration/diafiltration (UF/DF) bulk filtration step. Purification takes only three days, and the process is simple, robust, economical, and manufacturing friendly (“Development of a Simple and Semi-Continuous Monoclonal Antibody Purification Process,” Thursday, 8:45 AM). William Holmes (research scientist in virology and purification development at Eli Lilly and Company) also will present work on the development of a strong AEX system with multimodal functionality for MAb purfication (bind-and-elute chromatography). The platform approach for that polishing step, from laboratory to pilot scale, included performance across multiple antibodies and reduced AMounts of manufactured raw materials such as buffers (“Process Development and General Platform Fit of an Multimodal Anion Exchanger Following Protein A Capture,” Thursday, 9:15 AM). Flexibility in manufacturing equipment design and operations is becoming and important aspect of downstream processing, especially in UF/DF operations. Carnley Norman (scientist II at MedImmune) will report on a case study that showed how his company adapted a manufacturing-scale UF/DF system to produce a high-concentration, low-volume drug substance. That system was originally designed to produce a high-volume, low– product-concentration drug substance. Norman will detail guidelines for maximizing yield and minimizing facility fit risk (“Ultrafiltration/ Diafiltration Formulation Operation Strategies to Maximize Yield and Reduce Risk for Biopharmaceutical Drug Substances with Different Concentration/Volume Requirements,” Thursday, 11:00 AM). The 2011 BPI Conference will also host a series of presentations that focus on viral clearance and its importance in biopharmaceutical safety testing (“Novel Approaches and Applications for Viral Clearance” session will take place Wednesday, 8:00 AM – 12:00 PM). Jeri Ann Boose (director of biopharmaceutical services at Lancaster Laboratories) will report on current trends in viral clearance studies, including the importance of well-characterized virus stocks, application of QbD, use of worst-case model viruses to mimic recent contamination events, and viral inactivation programs for raw materials. Boose will also discuss the role of cleaning validation studies in a viral safety program (“Future of Viral Clearance,” 8:15 AM). A major concern in production-scale cell culture process is infection of mammallian cells by the presence of adventitious agents such as viruses in raw materials. One approach to reducing that risk is to use high-temperature short-time (HTST) treatment of cell culture media, which has been shown to be effective for viral inactivation. Salim Charaniya (engineer II of manufacturing sciences and technology, Genentech, Inc.) will present a case study from researchers who applied HTST in a nonplatform, commercial antibody production process. Cell culture media components were screened at bench-scale to explore susceptibility to thermal treatment. HTST tests were used to confirm those results at large-scale, and the company implemented the necessary procedural modifications in its media preparation process. Extensive cell culture characterization studies performed using a scale-down bioreactor system showed that HTST-treated media gave comparable product quality and process performance. Charaniya will also discuss the importance and technical feasibility of process modifications required for viral risk mitigation of production-scale mammalian cell culture processes (“Implementation of Viral Barriers for a Non-Platform, Commercial Cell Culture Process,” 8:45 AM). esentation will detail Lilly’s experience in the characterization of parameters important for inactivation kinetics as well as overall log reduction and robustness of the unit operation (“Detergent Viral Inactivation as a Robust Viral Clearance Step,” 11:00 AM). AEX generally provides 5–7 logs of viral clearance during MAb processing. In one study, researchers doing scale-up work discovered that AEX feedstream contaminants levels increased and the viral clearance through the step was lost. At the conference, Joseph P. Martin, Jr. (research fellow in purification process development at Pfizer Inc.) will present data showing how Capto Q resin was significantly better than Q Sepharose media in preserving viral clearance. Loss of clearance was associated with increased UV absorption. Martin will detail how the preremoval of contaminants from the AEX feedstream enabled high loads on Capto Q resin while preserving 5–7 logs of viral clearance at manufacturing scale (“Process Stream Contaminants Compromise Viral Clearance Over AIEX: Superior Performance of Capto Q Relative to Q Sepharose,” 11:30 AM). The conference offers a four-hour symposium on contamination control (“Contamination Control: Lessons Learned, Best Practices, and Case Studies,” Monday, 1:00–5:00 PM). Chaired by Robert D. Kiss (director of late-stage cell culture in bioprocess development Genentech, Inc.), the workshop will present best-practice approaches to mitigating contamination risk and real-world experiences in monitoring and control. Anthony Williams (senior manager of manufacturing operations at Human Genome Sciences, Inc.) will describe tools used to effectively bring a manufacturing facility on-line. His presentation will focus on documentation during execution to help mitigate contamination failure (“Making Every Detail Important so Microbial Contamination is Not an Option”). Identifying and addressing the root cause of bioreactor contamination can be a challenging task. Manufacturers can improve bioreactor pure-culture capability by evaluating weaknesses and identifiying high-risk targets. Stacey Masaaki Kaneshiro (senior consultant engineer of bioproduct R&D bioprocess operations at Eli Lilly & Company) will describe a case study in which that approach was taken. Kaneshiro will present findings and preventive and corrective actions that were implemented (“Search for a Needle in a Haystack, or just Deploy Better Thimbles: Lessons Learned in Improving Bioreactor Pure Culture Capability”). The symposium concludes with a presentation from Tim Hughes (director of clinical manufacturing, CSL Ltd) on Bacillus species contamination, which is a common contamination problem in bioprocess operations. Hughes’ discussion is based on more than 30 years of experience troubleshooting bioprocesses and aims to show how understanding how the biology of the organism helps you diagnose when infection occurred, where it might be lodged, and how to eliminate it (“Bacillus Wars: Tips on Eliminating One of the Most Troublesome Organisms in Bioprocessing”). Lyophilization of biopharmaceuticals is a common process step, but the science behind the technique is not yet well understood. J. Jeff Schwegman (CEO at AB BioTechnologies) will lead a symposium on lyophilization, including the design of an “optimal” process, on Monday afternoon 1:00–5:00 PM. As Schwegman observes, manufacturers typically use a trial-and-error approach to develop lyophilized products. During the past past 15 years, however, new tools and technologies have allowed development scientists to take a more scientific, empirical approach to formulation and cycle design. That allows them to design a formulation and optimize a drying cycle tailored for each product, which can maximize stability and minimize the preformulation, formulation, and cycle development processes. The workshop’s focus will be biologically based products (globular proteins, monoclonal antibodies). Moreover, the US Food and Drug Administration (FDA) is becoming increasingly educated in the practice and science of lyophilization, says Schwegman. As such, inspectors and reviewers are asking more questions about lyophilization during NDA or ANDA document reviews and site visits. The agency now expects companies developing new formulations and lyophilization cycles to explain scientifically why they chose each excipient in a formulation, why they are using as much as they have added, and what are the critical product temperatures. Companies that cannot detail this information run the risk of being delayed in product approval. So this workshop will provide guidance in the development of sound formulations and optimized drying processes for lyophilized parenteral drug products.